CAPE values tomorrow are through the roof for southern Minnesota. Model values are for 7:00 PM tomorrow night. Probably more of a heavy rain and hail event can be expected but we won't rule out the possibility of a tornado or two. Check out this map from WeatherGeek Pro! Plenty of energy in the atmosphere this afternoon for severe weather. CAPE values very high into the early evening hours! It was an interesting evening on Friday 6/21. We were out with family as storms moved in from the W/SW. Dinner and drinks were punctuated by several visits to the radar app on my phone. Where we were located, we lucked out having not lost power or having any visible damage to trees or structures. I know that was not the case for a lot of folks, guess we were just living right. On our travels home, we did come across a damage path which closely matched the radar image here. 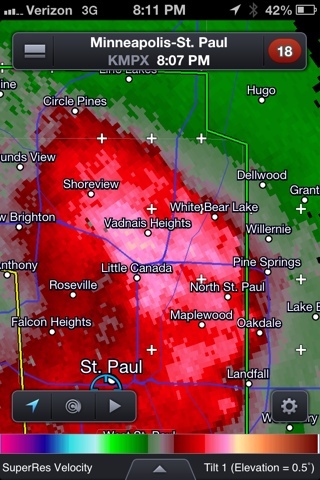 The bright pink areas indicate wind velocities of 60 mph or greater. It tracked through several suburbs from the SW to NE and made quite a mess of things. Trees down and significant damage to the local power grid where up to a half a million customers were without power now being reported as the largest outage in Minnesota history.